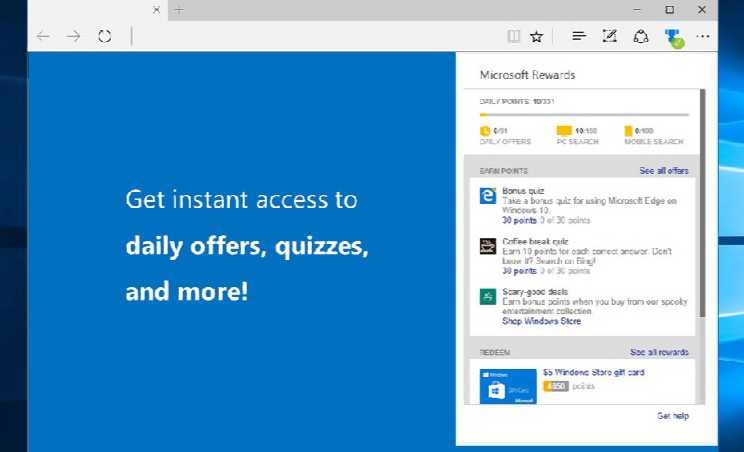 Microsoft released new Rewards extension for Edge browser. If you are a part of Microsoft Rewards program, now new extension will let you easily keep track of all the activity on your account. You can access the extension right from the address bar of Edge. You can keep track of your searches, you can also earn bonus points right from the extension. Rewards pop-up shows all the details from your rewards account as well as shows a little list of all the available rewards. Clearly see when you are actively browsing, so you know when you’re earning points. Quickly access daily offers and quizzes to earn additional points. See your rewards status including points balance, daily points earned, and progress towards a redemption goal. Currently, the rewards extension will work for the U.S citizens only. You can download the Microsoft rewards extension from Windows Store or from the link below.